Does North Korea need to import 641,000 tons of grain, like the UN says? North Korea requires about 641,000 tons of grain this year as the impoverished communist nation produced a below-average yield, a U.N. food agency said in a recent report. This would not be prohibitively expensive for the government to import. The shortfall, which must be made up with foreign assistance and imports, is up from 458,000 tons estimated for 2017 in the quarterly Crop Prospects and Food Situation report released by the Food and Agriculture Organization of the United Nations. I have my doubts about the accuracy of these estimates. It’s highly unclear how the Food and Agriculture Organization (FAO) has conducted any recent food production surveys in North Korea to generate these new figures. Even when they did such surveys on a regular basis, conditions were difficult as they were (at least to my knowledge) not able to freely visit farms and markets. 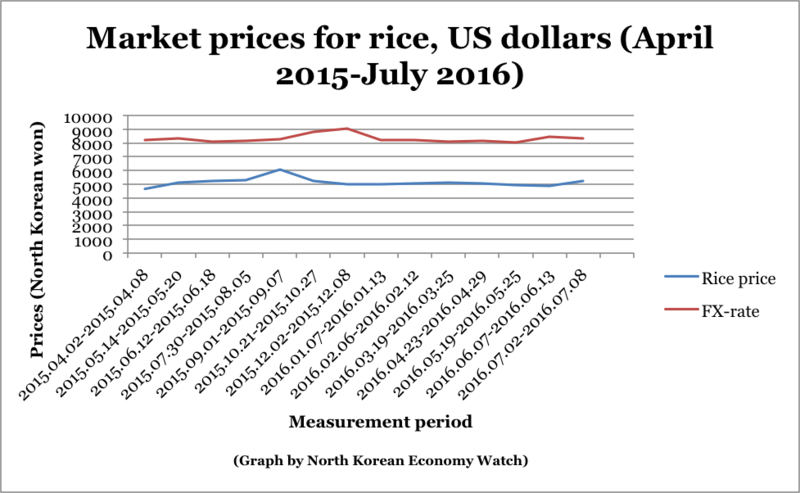 The role of the markets in agricultural distribution is still not fully or officially acknowledged by the North Korean government. I’ve emailed FAO with questions about the basis for these numbers, and will update the post if or when they respond. The problem is that the marketization of food supply makes it very difficult to create an accurate balance sheet for food needs and production. We don’t know precisely how much private plots produce, for example, or how much is imported outside of what the government reports to FAO. Again, all of this would be much easier to understand if more information was readily available about the FAO’s methods for this estimate. Here is the actual report by FAO. You can find previous reports here. North Korea has been providing just 360 grams of daily food rations to each of its citizens in the second quarter of this year, far below the United Nations’ recommendation, a media report said Thursday. Citing the report by the U.N. Food and Agriculture Organization (FAO), the U.S.-based media Voice of America (VOA) said the daily ration is 12 percent less than last year during the same period which was 410 grams, and 10 grams less than the previous quarter’s 370 grams. This is far less than the U.N.’s recommendation of 600 grams as well as the North Korean government’s target of 573 grams. According to the FAO’s recent report on the North’s food supply and demand for the grain in 2015-2016, the country’s grain production in 2015 was 5.42 million tons, a 9 percent decrease from the previous year. The report said North Korea’s rice harvest dropped 26 percent to 1.95 million tons last year from a year earlier, while its corn harvest contracted 3 percent to 2.3 million tons during the same period. FAO said that North Korea’s food shortage this year will be 694,000 tons which has to be filled either by external assistance or by imports from other countries. This is the isolated country’s worst food shortage since 2011. If North Korea manages to import some 300,000 tons of food this year, it will still face a shortage of 394,000 tons, VOA said. Some days ago, the Food and Agriculture Organization (FAO) sounded the alarm bells on North Korean food production. The drought of last summer, among other factors, has caused North Korea’s food production to drop for the first time since 2010. (Recall that in the past years, both North Korean media outlets and some analysts touted Kim Jong-un’s agricultural reforms — the former claimed that food production was increasing despite the drought. It seems they spoke too soon). Numbers like this, however, matter little without context. After all, five years is not a very long measurement period. Analysts like Marcus Noland have noted that the years following 2010 were probably exceptionally good. The current downturn might be best contextualized as a return to lower but more normal levels of food production. In other words, yes, the latest food production estimate represents a decrease, but it’s not that big. North Korean food production is still far larger than it’s been for most of the 2000s. It is also interesting to note the striking variation in North Korean government food imports. 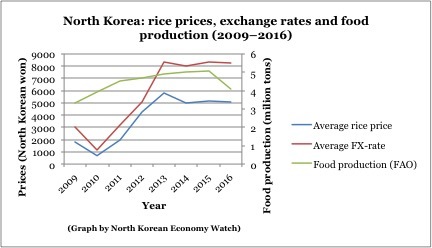 Marcus Noland and Stephan Haggard wrote in Famine in North Korea that the government downsized food imports as a response to increasing aid flows. Whatever the rationale might be behind the regime’s food import policies, they tend to vary greatly from year to year. In 2012/2013, the country imported almost 400,000 tonnes of cereal. In the mid-2000s, imports were close to one million tonnes, and they dropped to under 300,000 tonnes in 2008/2009. In 2011/2012, imports climbed to 700,000 tons. For 2015/2016, FAO projects a gap of need versus production of 694,000 tonnes, but government imports stand at around 300,000 tonnes, a relatively low figure in a historical context. Thus, North Korea is left with an uncovered deficit of 384,000 tonnes. Presumably, this wouldn’t be prohibitively expensive to cover by doubling cereal imports. The economy seems far more healthy today than it was in 2011-2012, and still, it managed to import more than double its planned imports of 2015-2016. 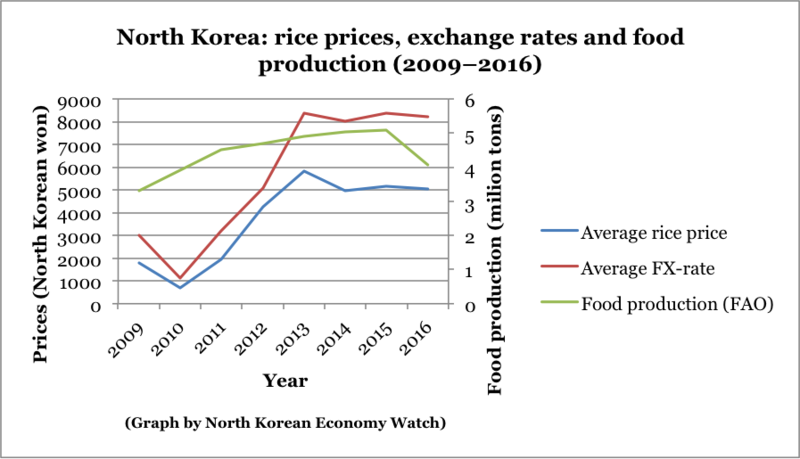 All in all, North Korea’s food production appears to be far from sufficient or stable, but the situation does not appear acute in a historical context. Indeed, one could argue that it’s a matter of policy choices and priorities: the regime could choose to increase imports to offset the decline in production, but its funds are spent elsewhere. And, of course, more efficient agricultural policies overall would make North Korean agriculture and food markets far more resilient to weather variations. First there was the drought. North Korean state media described it as the worst one in 100 years. UN agencies predicted large-scale crop failures and appealed for food aid, warning that large shares of the population would be at great risk if aid did not come. The UN’s emergency response fund (CERF) allocated $6.3 million to counter the impacts of the drought. The rains came, however, and the drought alarms seemed to have been exaggerated. Next, the North Korean media – assuming you can even talk about it as a single, coordinated entity – went the other direction. In July, the weekly Tongil Sinbo claimed that thanks to agricultural reforms, this year’s harvest had actually increased “despite adverse weather conditions”. And recently, reports turned the other way again. In early September, the Food and Agriculture Organization of the UN declared that the cereal production forecast for the main season of 2015 had declined drastically from last year due to a “prolonged dry spell”. The rain that eventually came in July and August, causing flooding in the northern parts of the country and leading to an estimated loss of one percent of all planted areas. The FAO rice production forecast for 2015 is 12 percent below that of last year. State food rations, the importance of which can be debated, declined drastically, according to the agency. The performers presented cheerful dances depicting the happy agricultural workers who work and live in the rural areas now turning into a good place to work and live thanks to the successful embodiment of the socialist rural theses under the leadership of the Workers’ Party of Korea. The picture gets even more complicated if one assigns meaning to the fact that cereal imports from China were reportedly lower in July this year compared to 2014. Figures from just one month might not indicate a trend, but given that July was a particularly dire month, these figures are still significant. 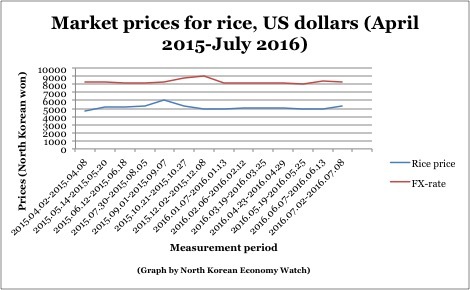 If imports are being decreased because the official line is that agricultural conditions have improved, no matter the reality, that might be bad news for those in the North Korean public that rely on the public distribution system for any significant part of their consumption. Either the FAO is right and the North Korean government wrong, or the other way around. Harvests this season cannot have been improving and getting worse at the same time. The FAO is probably far more likely than the North Korean government to have made a correct assessment here. Even if North Korean authorities aren’t claiming success of the reforms for propaganda reasons – which they may well be doing – it is hard to see why their statistical and monitoring capabilities would be better than those of the FAO. So, the North Korean government is claiming that agricultural reforms are leading to better harvests and food conditions, even when they probably aren’t. Why would they do that? There are lots of possible reasons and one can only speculate. One possible reason is that the agricultural reforms have become a prestige project. North Korean propaganda channels and news outlets have publically claimed that reforms are being implemented and leading to good results, even though some adjustment problems have been admitted. The same pattern, by the way, can be seen with regards to forestry policies – state media has publicized them with a bang and claimed that they just aren’t being implemented well enough by people on the ground when they don’t seem to be working as intended. This could be an indication that agricultural reforms are indeed, like many have assumed, a major policy project of Kim Jong-un and the top strata. That could be good news. After all, North Korea is in dire need of changes in agricultural structures, production methods, ownership and responsibility. But it could also be bad news. When policies are strongly sanctioned and pushed by the top, their flexibility is likely to be inhibited. In other words, if the top leadership says that something should get done, it has to get done regardless of whether it works well or not. Again, look at the forestry policies. According to reports from inside the country, those tasked with putting the new policies into practice on the ground say that doing what the central government asks isn’t smart or possible. Nevertheless, such orders are hard and risky to question. At this stage it is only speculation, which is always a risky endeavor when it comes to North Korea. It may well later turn out to be wrong. But if the state is placing enough prestige in the agricultural reforms to claim that conditions are improving even if they aren’t, that may lead to limited flexibility in how they are implemented and changed in the future. In other words, if the leadership thinks they are important enough to claim success even when things are getting worse, they may not be prone to changing their orders to fix what isn’t working. You are currently browsing the archives for the UN Food and Agriculture Organization category.